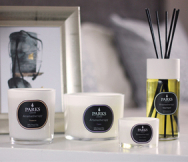 The Moods by Parks collection features scent combinations which were created specifically to evoke a certain mood in whoever beholds it, and to make your living environment more friendly and open to certain states of mind. As this scent is simply named ‘calm’, you can guess what mood we blended it for. This is a scent that will help to soothe, centre and relax you, no matter what obstacles life might currently be putting your way. The complex scent is a blending of patchouli, cedarwood, tuberose and chamomile. Each of these scents is carefully derived by traditional methods and then combined with the highest quality soot-free wax. They are hand poured into a decorative blue votive vase around one of our unique smokeless wicks. In this way, we ensure that nothing comes between you and the purity of the scent, or between you and the calmness that you deserve in your life.